Banff & Buchan MSP Stewart Stevenson has welcomed the publication of the Scottish Government’s draft bill for a referendum on independence, which has signalled the launch of a consultation on the constitutional options that should be put to the people of Scotland. As well as a decision on Scottish independence, the draft referendum bill proposes to give people in Scotland the option of deciding on whether the devolved powers of the Scottish Parliament should be increased. The public consultation will seek views from across Scotland on whether the option for an increase in devolved powers should be based on the proposals contained in the Calman Commission’s report or the alternative of ‘Devo Max’ outlined as part of the Scottish Government’s National Conversation. The referendum would take a similar format to the one that re-established the Scottish Parliament, with a first yes or no question on additional devolved powers for Holyrood followed by a second yes or no question on independence for Scotland. “The people of Scotland have an inalienable right to decide upon the constitutional arrangements that they wish to see in Scotland, and I welcome the fact that we have moved a step closer towards a referendum on what those arrangements should be. “The UK Government is planning a referendum on changing the voting system for Westminster while the National Assembly for Wales is planning one on increasing their devolved powers. 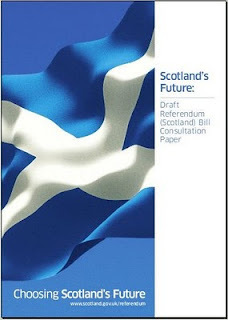 Clearly this is the right time for Scotland to make our own decision on our constitutional future too and I encourage people across Scotland to take part in this consultation to decide what option for further devolution should be on the ballot paper. “The Scottish Parliament was reconvened after a successful yes-yes campaign in the referendum on devolution and I believe that the people of Scotland will return the same result in a referendum on independence. Scotland's climate change targets are 'challenging but achievable' if the EU framework is tightened, according to an independent assessment published today. The advice from Committee on Climate Change highlights the scale of the opportunities associated with driving down emissions and building a low carbon economy. "The need to take action to reduce our emissions is clear and everyone has a role to play in helping Scotland meet its world leading climate change targets and ensure that Scotland is at the forefront of further developing a low carbon economy. Achieving the necessary reductions in emissions will require hard decisions, not only by Governments but also by businesses, the public sector, voluntary and community groups, and individuals. "The Committee's advice is a significant piece of work that Ministers will consider in full. It will play a key role in informing secondary legislation that we will bring forward in April on annual targets, aviation and shipping and limiting the use of carbon units. I thank the Committee for their effort and look forward to engaging further with them. "The Scottish Government will continue to engage with our partners in the international community, EU and UK and hope that they will increase their ambition to meet the challenges and opportunities presented by climate change. Together, we need to make the commitments, take the actions and help the world avoid dangerous climate change." It’s been confirmed that funding will be made available to Caledonian Maritime Assets Ltd (CMAL) to assist the progression of initial infrastructure improvements at Port Ellen and enable the new Islay ferry to be accommodated at Kennacraig, after the Scottish Parliament passed the Government’s 2010 Budget Bill. CMAL is already carrying out a refurbishment of the existing linkspan at Port Ellen, which began on February 15th, comprising of steelwork repairs, raising the level of the linkspan, as well as an extensive mechanical overhaul and lifting rope replacement along with painting. Construction of a new quay wall at Port Ellen, used by the local fishing fleet, was successfully completed on time and within budget in January 2010, and is already in full use. As a result of a berthing incident with the Isle of Arran earlier this month, substantial damage occurred to the port infrastructure at Kennacraig. CMAL and CalMac Ferries Ltd (CFL) have worked together in partnership to effect immediate repairs. The CMAL ports and harbours team with CalMac Ferries Ltd (CFL) are planning to hold public meetings in Port Ellen week commencing 5th April to update local people and businesses on their plans for the future. More details and confirmation of the dates of these meetings will be published shortly. “This considerable investment will ensure services to Port Ellen are safeguarded at a time of great economic pressure when difficult spending decisions are having to be made. The Scottish Government is demonstrating its commitment to the people of Islay by providing these funds which, supported by investments by CMAL, will allow the new £24.5M Islay ferry to use the existing pier at Kennacraig when she comes into service and maintain lifeline services to Islay's two ports." The bus concessionary fare scheme will be maintained and funding for the Bus Services Operators Grant will be increased as a result of a new funding agreement with the bus industry. The package was agreed following discussions between the Scottish Government and the Confederation of Passenger Transport (CPT). Funding for the Bus Service Operators Grant (BSOG), which benefits passengers by helping support the bus network and keeping fares affordable, will increase to £66.5 million in 2010-11. The scheme will also provide incentives for operators to operate low carbon vehicles, including hybrid buses. The reimbursement rate for the Concessionary fares scheme will be revised to 67 per cent following detailed independent analysis commissioned by the Scottish Government in response to one of the key recommendations emerging from the independent review of the scheme in May 2009. "The Scottish Government is committed to supporting our bus industry, and this agreement with CPT will deliver another three years of significant investment. This substantial outlay is intended to help the industry drive down fare costs, encourage more routes and enable more older and disabled people to use these important services. "Older and disabled people will continue to be able to travel for free throughout Scotland - at any time, on any bus routes, for any number of journeys. "The concessionary fares scheme will also be extended to include injured veterans from April 1, 2011. "In these challenging economic times, it is important to protect passengers by minimising fare increases which is why we have decided to increase BSOG funding. Reducing emissions from transport is key to achieving our world leading climate change targets and a shift to low carbon buses will make an important contribution to reducing emissions. "We have agreed to work with the Scottish bus industry this year to consider further changes to the BSOG scheme to better align the scheme with our vision of a low carbon future, by encouraging more drivers out of their cars and reducing emissions. "Latest data shows that Scotland provides 17 per cent more industry support per head of population than in England." The reimbursement rate is being revised from 73.6 per cent to 67 per cent. The review of the concessionary fare scheme was completed in May 2009 and looked at how the scheme operated since its introduction in April 2006, looking at what further improvements could be made. Climate Change Minister Stewart Stevenson last night called on world leaders to up their ambition on climate change. Speaking at the Northern Regions Climate Change Summit, the Minister said that if all countries showed greater ambition then the promised cuts in emissions would help the world avert dangerous climate change. “Scotland is already taking a lead on climate change, but more countries must show their hand and make that all-important top level commitment to reducing emissions. “Northern nations like Scotland and Norway are already taking a lead. And if we can do it, then the rest of the world can follow our example and make the changes needed to address the challenge of climate change and deliver the economic benefits a low carbon future can bring. “It is clear that we will need to harness low carbon technologies to respond to the challenge of climate change and keep the pledge made in Copenhagen to limit the increase in global temperatures to 2C. “Scotland is showing the way on renewables development. Recent progress includes the Crown Estate unveiling plans to develop almost 5GW of offshore wind energy off the country's east coast. A recent Scottish Enterprise report identified a priority list of Scottish sites for renewables development, showing opportunities for investment spread right across the country. “As a country we will continue to show leadership in the fight against climate change, working hard with our partners in the UK, Europe and across the world to become an international leader in alternative energy technologies and develop new economic opportunities for Scotland." An investment of just under £6m for a package of improvement works on the A9 has been announced by Transport Minister Stewart Stevenson today. The package includes a £2.6m contract for an overtaking lane at Moy, a £2.6m road surface upgrade scheme at Ralia and a £600,000 dualling design works between Birnam and the Jubilee bridge, north of Dunkeld. “This Scottish Government is committed to improving this vital link between Perth and Inverness, and this £6m package of works is another important step toward delivering safer and quicker journeys on the A9. “This key route is seeing over £16m of improvements during a three year period, with the completion of schemes at Carrbridge and Bankfoot last year, the works at Moy and Ralia this year and also a project at Slochd scheduled for next year. “These schemes, coupled with the design works being undertaken for future enhancements, further demonstrate our commitment to invest progressively in the A9 on a continuing basis, leading to dualling of the route between Perth and Inverness. The design work is the first part of the package of works to be rolled out, with surveys commencing shortly. Part of Transport Scotland’s Strategic Transport Projects Review, this will complement the accelerated design work already undertaken on the section between Luncarty and Pass of Birnam. The £2.6m contract for Moy, 30km north of Aviemore, has been awarded by Transport Scotland to Aggregate Industries and will begin in March, lasting for 12 weeks. The project will see the construction of a new northbound overtaking lane of 1.1km and a new right turn lane, as well as the closure of an unclassified road leading from the A9 to the village of Moy. At Ralia, near Newtonmore, structural improvements will be made to 3.2km of carriageway, benefitting road users with a new high standard surface. The maintenance project, which is also expected to start this spring, will last for ten weeks. Both projects will use the modern, greener and more sustainable method of ‘crack and seat’ construction. This approach brings benefits by reducing carbon emissions, as there are less deliveries, and lowers waste output by recycling existing materials. 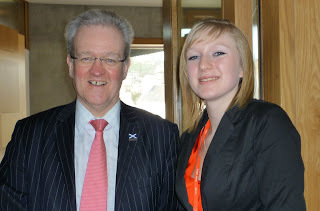 Banff & Buchan MSP Stewart Stevenson yesterday (Thursday) met with one of the Members of the Scottish Youth Parliament for Banff & Buchan as she visited the Scottish Parliament. The Scottish Youth Parliament is an organisation committed to ensuring that the voice of Scotland’s young people is listened to by all decision-makers. There are two MSYPs covering the Banff & Buchan constituency. “The Scottish Youth Parliament provides an important voice for young people across the country, and I was glad to have had the opportunity to host one of Banff & Buchan’s youth representatives as she visited the Scottish Parliament. “I was delighted to be able to visit the Scottish Parliament and meet with my local constituency MSP. It gave me the chance to discuss issues that are important to young people in Banff & Buchan and I think we covered a good range of topics. A new group to lead Scotland's public sector in cutting carbon emissions has met for the first time. The Scottish Government and COSLA are joining forces to identify and promote the actions needed across the public sector to meet Scotland's ambitious climate change targets. The group will also provide a crucial link between the public and private sectors. The Climate Change (Scotland) Act requires public bodies to tackle climate change. Climate Change Minister Stewart Stevenson and Councillor Alison Hay, COSLA Spokesperson for Regeneration and Sustainable Development are co chairing the group. Members will come from public bodies and the Convenor of the 2020 Climate Delivery Group will sit as an observer. "With the urgent need to reduce emissions and world leading climate change targets to meet, all of Scotland must tackle climate change. The public sector shares that commitment to act and is already playing its part - for example taking part in the Carbon Trust's Carbon Management Programme to reduce emissions, through innovative procurement of energy or in new sustainable schools. "This new group will give leadership and direction to the whole of the public sector. We need to ensure that successes are shared and effort not duplicated as we move to a low carbon economy. The public sector also needs to engage with the private and third sectors and this group will provide that crucial link as we all look to replicate successes across Scotland." "On behalf of Scottish local government I welcome the formation of this joint public sector group, convened to look at what we can do collectively to meet the challenging targets that lie before us. We need to be able to work with the Scottish People and the Scottish Business Sector to achieve the behavioural change as well as attract investment into the future." The group will promote climate change actions, share good practice, maintain an overview of climate change work already underway to get value for money to avoid duplication of effort and link with the 2020 Climate Delivery Group convened by Ian Marchant. The Scottish Government will publish draft guidance for public bodies on fulfilling their duties later this year. The Scottish Government today launched a document which sets out planning policy on topics such as housing, wind farms, flooding and the natural and built environment. It replaces 17 separate policies with one single document which is easier for communities and developers to understand and interpret. Also published today is a circular updating guidance on the criteria and processes when developers are required to make a contribution to the provision of local infrastructure, where a development would create additional infrastructure demands. "The Scottish Government has listened to voices calling for a more effective and efficient planning system. We have acted by introducing a package of measures to provide applicants, communities and the development industry with greater certainty and speed of decision making. "By consolidating planning policies into one, single document, we are providing a shorter, clearer and more focused statement of national planning policy. And our new circular spells out the importance of speeding up the planning agreements process, enabling swifter issuing of planning permission. "Our Economic Recovery Plan ensures all Government activity, including on planning and regulation, supports economic development. Having the right planning advice and information in one place builds on our work to ensure planning is an aid, not a barrier, to economic development." "The Scottish Property Federation welcomes the revision of the circular on planning agreements, and supports the emphasis on reasonable and proportionate contributions. It is vital in the current fiscal environment that both the private sector and local authorities support the Scottish Government's clear intention that planning agreements should be realistic and guided by development economics and viability. "We also welcome the publication of the consolidated Scottish Planning Policy (SPP), with its emphasis on facilitating and encouraging appropriate development. Implementing the SPP will require political leaders, planning officials and the private sector to redouble their efforts to build strong working relationships to deliver the quality planning system that Scotland deserves." Banff & Buchan MSP Stewart Stevenson has welcomed the passage of the SNP Government’s third budget since its election in 2007. The budget secured was successfully passed after only Labour MSPs chose to vote against its measures. This is the first budget that will see a real terms decline in spending in Scotland for 17 years, with projects having to be prioritised as a result. “I welcome the fact that this year’s budget process has avoided the chaos we saw last year as an unfortunate result of the political games that some parties chose to play with people’s livelihoods. The fact that consensus could be reached with most parties is welcome, although the Labour party’s decision to opt for political posturing again was as predictable as it was disappointing. “This budget was about setting priorities and protecting public services from the first real terms cut in spending since the advent of devolution. I believe that John Swinney struck that balance effectively and the passage of this budget is good news for people in Banff & Buchan. “It will see NHS spending increase by 2.7% as the Scottish Government continues its efforts to improve the health of people in Scotland, while funding is again in place to continue the freeze on council tax which puts money back into people’s pockets during these difficult times. One of the biggest civil engineering operations in Scotland is taking place in Glasgow over the next two weeks. The launch of the Port Eglinton Viaduct is part of the work going on to complete the missing link between the end of the existing M74 at Fullarton Road and the M8 south of the Kingston Bridge. The scheme involves a number of crossings of roads, railways and the River Clyde. The Port Eglinton viaduct, 750 metres long, is the largest of 13 structures along the route of the motorway. The 135m span over the West Coast Main Line and Eglinton Street, is being launched into place rather than being placed by conventional crane lifts. The launch takes place overnight when to avoid disruption to train services. "The work to complete the M74 is moving on apace. Already anyone travelling through Glasgow can see the structures which will support the new road taking shape. "This latest launch of the Port Eglinton Viaduct, a complex and challenging civil engineering operation, will be visible to all to see as it is pushed out across the West Coast Main Line. "We are delighted to have reached this key point in the M74 Completion Project. The Port Eglinton viaduct launch has represented a major technical challenge which required an innovative solution. "This has been a major effort with great credit to our staff, workforce, designers, sub-contractors, client and stakeholders and is typical of the way we have worked together in a partnering way to the benefit of the whole project." 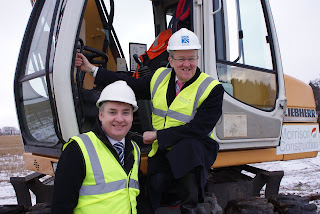 "This is a significant milestone in the construction of the M74. It is a very visible sign of the work that's taking place to deliver a project vital to the future growth and success of the city. "The project itself is providing a range of employment opportunities and its completion will have a major boost to our city's economy." Banff & Buchan MSP Stewart Stevenson is urging local residents to dig deep to help Haiti. He is calling on people in Banff & Buchan to support the DEC Haiti Earthquake Appeal by donating to help those affected by the devastating earthquake. “The people of Scotland have already shown enormous generosity to help the people of Haiti, but aid agencies still face huge challenges in the region. I would urge people in Banff & Buchan to support agencies like the Disaster Emergency Committee (DEC) by giving whatever they can afford to fund the essential aid required to meet immediate need, as well as helping to rebuild people's lives and livelihoods in Haiti in the longer term. “Despite the challenges, DEC member agencies are working round the clock to make sure that survivors of the Haiti earthquake get food, clean water, emergency shelter, medical care and other support. Scottish Minister Stewart Stevenson has seen at first hand the 'green revolution' taking place at Michelin's Dundee factory during a visit to the Baldovie Road site. Mr Stevenson, the Minister for Transport,Infrastructure and Climate Change and MSP for Banff and Buchan, was given a guided tour of the factory during which he saw the environmental innovations and products that have helped shape the Dundee factory into one of the most carbon neutral in the Michelin Group. Those innovations include the factory's two wind turbine generators, which were first unveiled and put into operation in 2006. Since then the turbines have made a significant contribution in reducing the energy output of the factory – with the environmental and financial benefits being translated into reducing costs by a third. The Minister also saw the manufacturing facilities that produce Michelin's new Energy Saver tyre - the latest generation of green tyre which promises to cut rolling resistance,improve fuel consumption and reduce the amount of CO2 emitted during driving. The tour of the factory was conducted by the new Michelin Dundee Factory Manager John Reid, who has taken over the lead role at the head of the Dundee site's operations from Trevor Haines. Mr Reid, who has worked for over 20 years with Michelin with much of that time spent at the Dundee factory, said: “The Minister was very impressed with what we are doing here at the Dundee site. He showed a lot of interest in what we are doing on site to reduce our carbon footprint and the products we are involved in manufacturing that will assist in reducing that impact further on a larger global scale. Mr Stevenson got the opportunity to hear about the excellent environmental performance of the Dundee factory which included the site registering a 21% reduction in its carbon footprint by 2009 – two years ahead of the Michelin Environmental Footprint Programme's (MEF) target of a 20% environmental impact reduction across all production sites by 2011. The Dundee plant has also registered zero landfill since 2007 and reduced its energy use since 1998 by 30%. The Minister also met with staff from the factory and was given a presentation about Michelin Development – the business development arm of the tyre giant. Michelin Development is a business loans fund, dedicated to helping small and medium sized businesses that can create new employment in the areas of the UK, including Dundee,where Michelin has present or historic links with the community or region. Stewart Stevenson said: “The Scottish Government has the most ambitious and comprehensive climate change legislation anywhere in the world, and companies like Michelin have an important part to play as we strive to reach our targets. The Dundee factory manufactures over 6.5 million car tyres each year,mainly for export, all over the world. Opened in 1972 it currently employs 850 people on site. It remains as the only tyre manufacturing plant in the whole of Scotland and is one the largest private sector employer in Dundee. The wind turbines opened at the site in 2006 marked Dundee as the first Michelin factory in the world to embrace wind energy with two wind turbine generators. Transport Minister Stewart Stevenson signalled the start of works for the A96 Fochabers and Mosstodloch scheme by turning the first turf today. Work on the scheme, which is being carried out by Morrison Construction, will see a new 5km stretch of all-purpose single carriageway on the main road between Aberdeen and Inverness. The £31.5 million scheme, combined with a host of other works on the A96, reinforces the Scottish Government's commitment to the route. "The A96 Fochabers and Mosstodloch road scheme is another example of our continuing investment in Scotland's transport infrastructure. This is an essential route in Scotland's trunk road network, and I'm delighted to personally kick off construction on this vital project. "When complete, the stretch of new road will improve transport links along the length of this route, help tackle congestion in and around Fochabers and Mosstodloch, as well as bring economic benefits for businesses and communities right across the north. "Indeed, our commitment to the A96 as a whole is clear. In recent weeks we have announced a package of improvements for delivery this financial year which will ease congestion and improve journey times through Elgin. We are also working with our partners at Highland Council reviewing proposals for dualling the A96 between Inverness and Nairn, a Nairn bypass, and a link between the A9 and A96 to the east of Inverness to inform their work on the Highland Wide Local Development Plan. "The Scottish Government is working tirelessly to deliver improvements across Scotland's trunk road network and the start of construction today on this section of the main artery between Aberdeen and Inverness, underlines this." "We understand that this project has been on the drawing board for many years and are delighted to be making a positive contribution in bringing it to reality. We look forward to working closely with Transport Scotland, the local community and all interested parties to ensure the success of the project." Work on the scheme is expected to be completed by Spring 2012.